. . .ep and wail, for he was afraid that when his old woman got to know she would be the death of him. But all at once it came into his head to go home and get the other ox, and drive it to the town, and take good care that his old wife knew nothing about it. So he did this; he went home and took the ox without his wife's knowing about it, and went on his way to the town with it. But the robbers they knew it well, because they got out their magic. So they told the youth that if he could take this ox also without the man knowing anything about it, and without doing him any hurt, he should then be on an equality with them. 'Well, that will not be a very hard thing to do,' thought the youth. This time he took with him a rope and put it under his arms and tied himself up to a tree, which hung over the road that the man would have to take. So the man came with his ox, and when he saw the body hanging there he felt a little queer. How I read these books when I was a child. . . .
Again no surprise here, exactly what to expect. I liked to see some of the older version of my favorite fairy tales! Some are boring and most are repetitive. Another one from the colored fairy books gone, ten left. The stories are so enjoyable, especially as an audiobook. 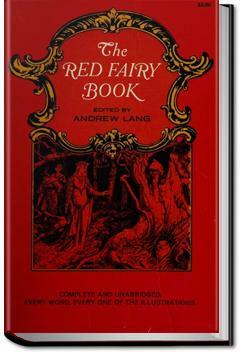 I first encountered the Lang collection, often called the Colored Fairy Books because of their titles (Blue, Olive, Crimson, etc.) when I was in elementary school. I enjoyed them because they were so different from the sanitized, prissy princess, modern versions.